Another promotion for the month of October only - join today! 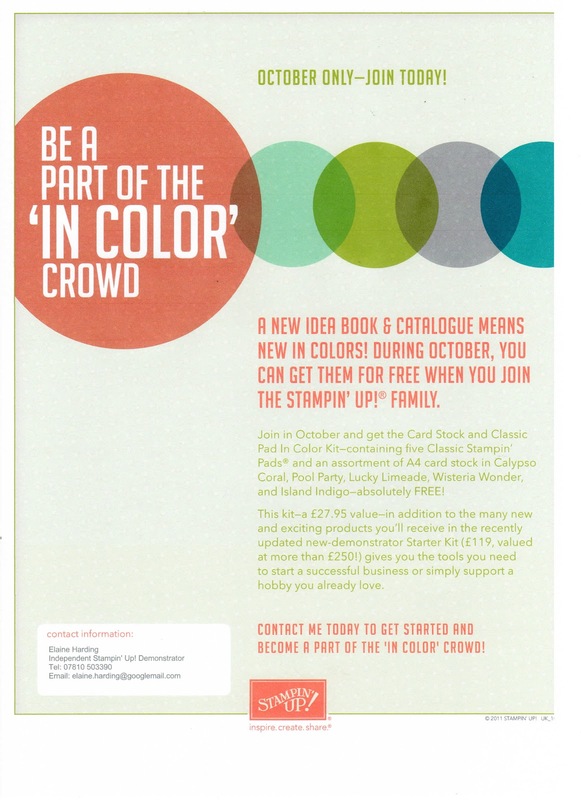 Do you want to be a part of the "In Color" Crowd? Stampin' Up! is giving the new In Color Kit away for FREE if you join my team in October! You will get the Card Stock and the Classic Pad In Color Kit containing five Classic Stampin Pads and an assortment of A4 card stock in Calypso Coral, Pool Party,, Lucky Limeade, Wisteria Wonder and Island Indigo absolutely FREE! This kit is valued at £27.95 and in addition to the many new and exciting products you'll receive in the recently updated new demonstrator Start Kit (£119 valued at more than £250) gives you the tools you need to start a successful business or simply support a hobby you already love.